Wicca has infiltrated the Church! Spiritual Warfare against the Wiccan Invasion! WICCA (White Witchcraft) is widely accepted today as a harmless, New Age spiritualism. Taught in schools, promoted in social programs, churches and media, Wiccan paganism is spreading like hellfire via a successful multi-faceted PR campaign! But what exactly is WICCA? Is it really an evil counterculture religion? If so, how did it infiltrate today’s mainstream denominations? And how can Christian Wiccans declare their paganism and spread a false gospel while sitting in the pews unchallenged? Equipping you with prophetic Scriptures and spiritual warfare strategies, Dr. William Schnoebelen takes aim with the arrow of deliverance against enemies of Messiah’s Cross in his newest DVD teaching, CHURCHCRAFT: WICCA, CHRISTIANITY & the End of Days! Prayer warriors and intercessors, parents and pastors - stand for this nations’ young people who are increasingly alienated and at-risk from WICCA and CHURCHCRAFT Christianity! Learn how to discern WICCA in your home and congregation with this vital teaching. A former Wiccan high priest, occultist and Illuminist, Dr. William Schnoebelen has brought prophetic and equipping teachings to the Body of Messiah for over 30 years. 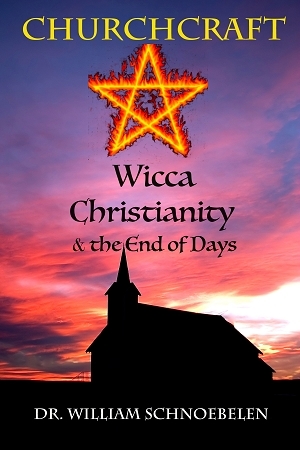 Here, he outlines spiritual warfare strategies against the new pagan invasion – WICCA - boldly making a clarion call to End Time Believers in this crucial DVD teaching!